Ferry on fire, 200 passengers going to liferafts in the middle of Java. Ferry DHARMA KENCANA II with some 200 passengers on board caught fire in the morning Oct 29 in the middle of Java Sea in position 05 04S 109 54E, while en route from Samarang Central Java to Pontianak, western Kalimantan. Not much known what’s going on there, all passengers said to abandon ferry, going to life rafts. Tug and a ship BASARNAS (probably Navy) are at the site, rescuing passengers. According to latest news, all passengers were rescued, ferry still on fire, understood crew also abandoned the ship after fire spread to upper deck. There were 114 passenger on board and about 40 vehicles, fire was reported at 0445 Jakarta time. 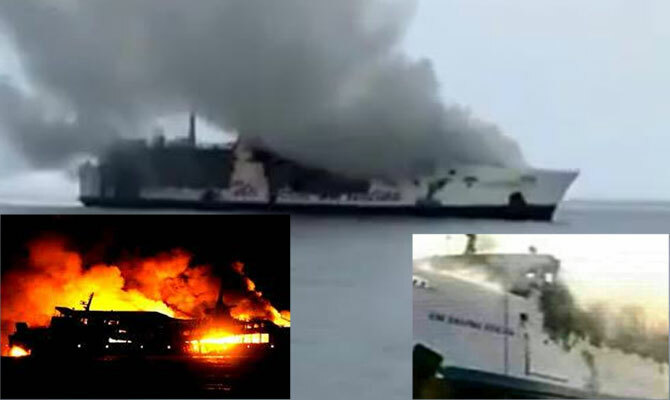 At least 9 commercial ships, SAR and patrol ships were sent to burning ferry. According to official statement, no casualties were reported.